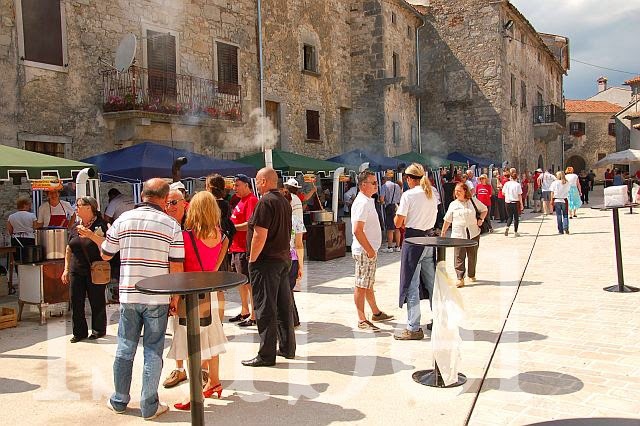 Istria with its many gastronomic delights is a paradise for foodies. Throughout the year, there are many food and gastronomic festivals happening across the Istrian peninsula celebrating a certain seasonal vegetable or typical local dish... asparagus is feted in Lovran in April, seafood in Vrsar in June, and the tomato in Umag in July; while in November it’s the turn of the truffle in Buzet and Livade, mushrooms in Brtonigla, and olive oil in Vodnjan. 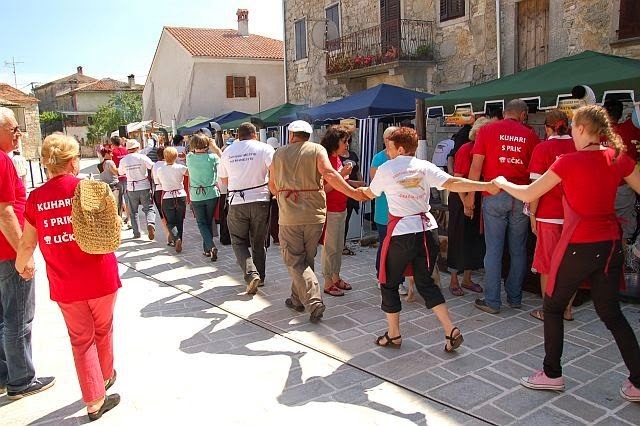 Gračišće’s best known event is the wine festival which takes place each year on Easter Sunday. 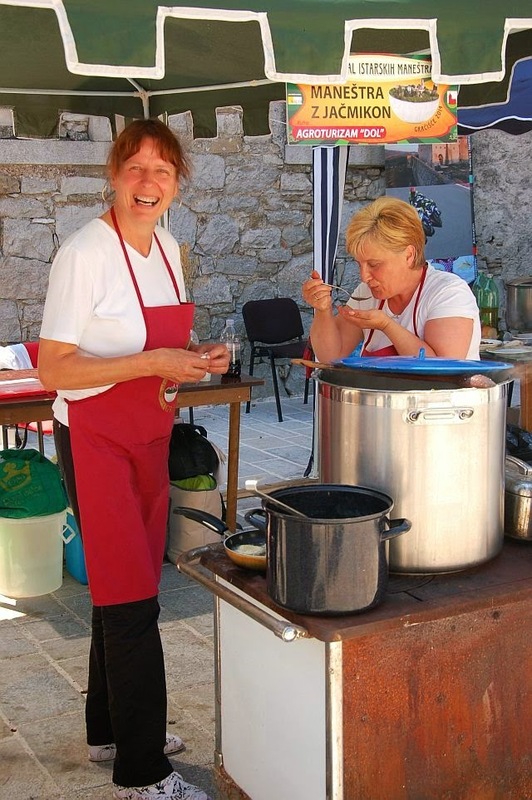 Then on every 2nd Saturday in June the village hosts the maneštra festival (festival istarskih maneštri in Croatian). 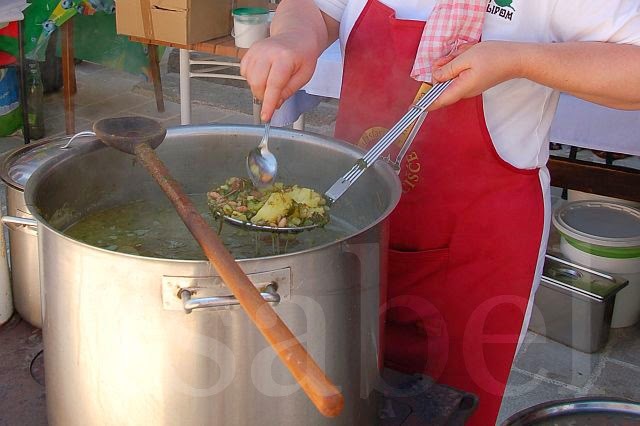 Maneštra is a typical Istrian dish, which is very much like Italian minestrone (the names are also very similar). This is a hearty soup made with a mix of different vegetables and pulses. Some popular ingredients used to make maneštra include barley, corn, cabbage, potatoes, beans, chickpeas, turnips, fennel… to name a few. Pork meat is also often added. 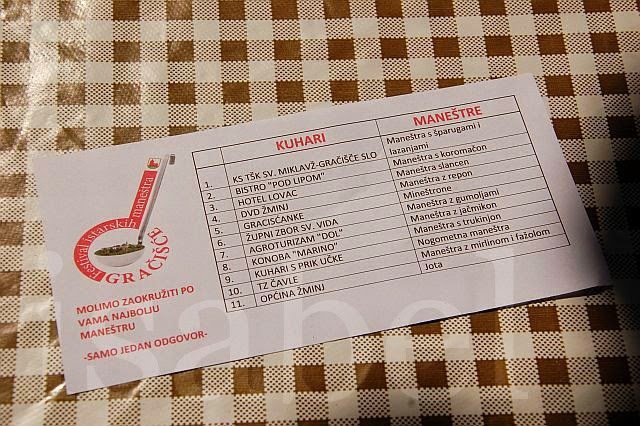 This year there were 11 different types of maneštra on offer, prepared sur place on wood-fired stoves by local chefs. A list of the 11 different types of manestra on offer. Visitors could vote for their favourite. A neighbour who was participating decided to prepare a vegetable maneštra, without any kind of meat or any animal products (much to my delight!). 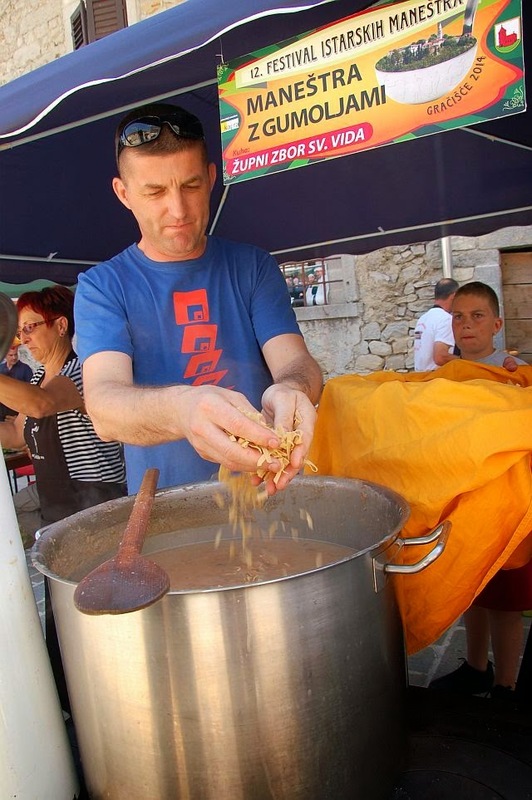 Traditionally, maneštra was rarely made with meat, because it was not as readily available as it is today. Today, however, pork is almost always added. That’s why my neighbour’s vegan maneštra was an unusual competitor this year, despite the fact that it was actually more traditional and therefore ‘authentic’. 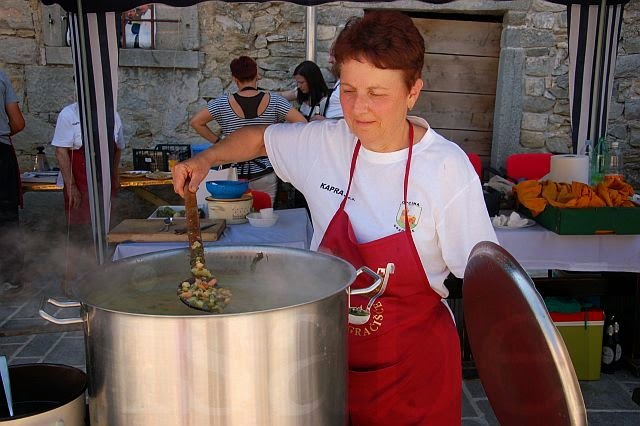 I’m glad she chose to make a vegetable maneštra, because the jury awarded her 2nd prize! Veggie power - 2nd prize! The barley manestra won 1st prize. While the noodle manestra took 3rd prize. The public awarded the prize for best manestra to the 'football' manestra. Visitors also had the chance to vote for their favourite. 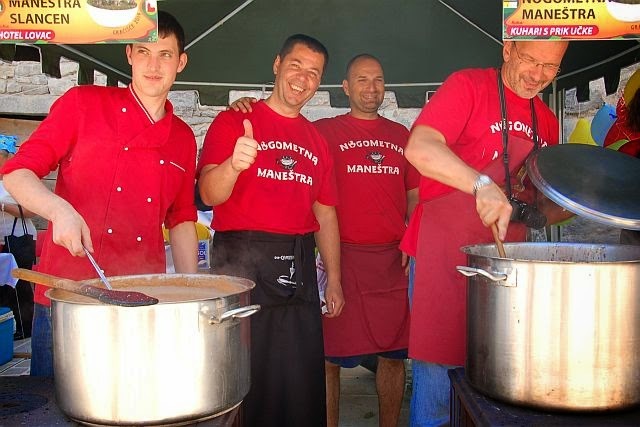 The prix du public went to these guys who in the spirit of the World Cup, cooked up a 'football' maneštra. Where there's food, there's music! A live band kept spirits high. The cooks broke out in a spontaneous dance around the square. OMG going to this would be like dying and going to heaven!! !